Looking for some wicked jackpot prizes? All you have to do is spin to win Blankety Blank Slots! There are up to 30 FREE spins, multipliers, great bonus features and loads of fun! Good luck! 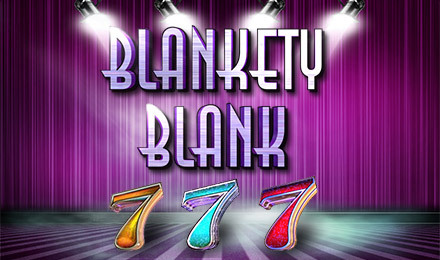 Blankety Blank Slots is based on the hit TV show, which rewarded players with incredible prizes. Play today to win your own mega jackpot prizes! Your Wild is the Blankety Blank logo. It will substitute in for any symbol except for other bonus symbols, and will multiply your wins. The Scatters are B, L, A, N and K, and when they all appear at once, your bonus round will begin. There are up to 30 FREE spins plus a Super Match Bonus where you'll get multiplied wins. Whether or not you're a fan of the show, you're guaranteed to love the slot game!